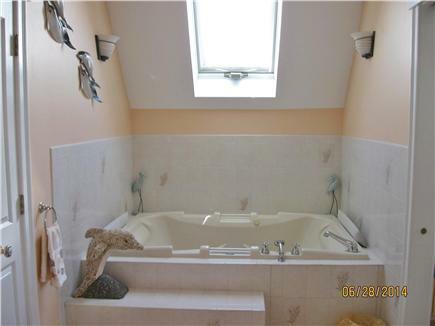 Master Bath Jacuzzi, also has walk in shower! 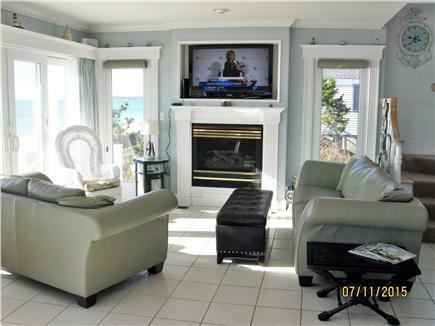 Relax on 1st floor deck overlooking private beach! View from deck, steps away from sandy beach. 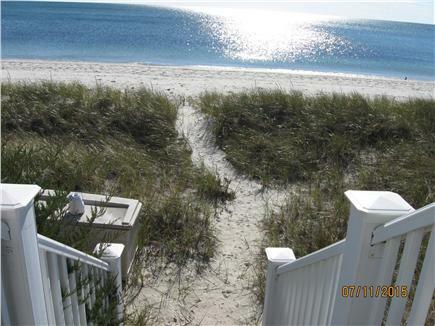 Single family home nestled on the sand dunes of a 1/4 mile private sandy beach located in Great Island Ocean Club. 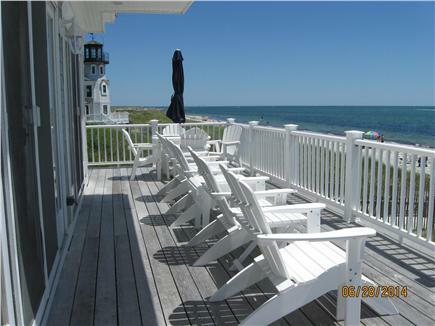 One of Cape Cod's most sought after vacation spots. The house is located directly on the ocean with the community swimming pool directly across from house. Tennis courts and playground are also available. 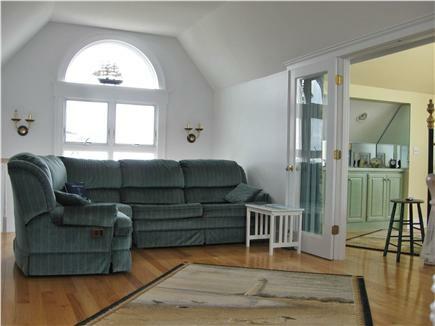 Close to shopping, amusements, entertainment and Hyannis center. 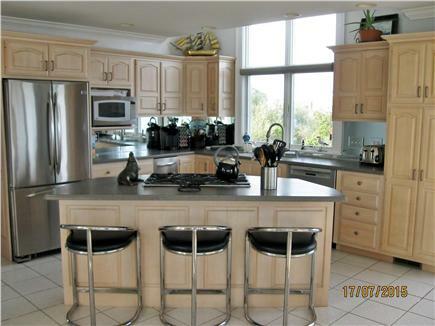 Kitchen is fully equipped with all stainless appliances. 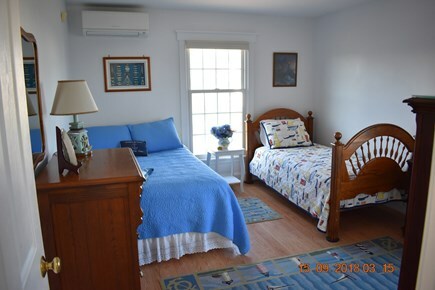 First floor has two bedrooms, one with a queen size bed and the other with a full size bed and twin bed. 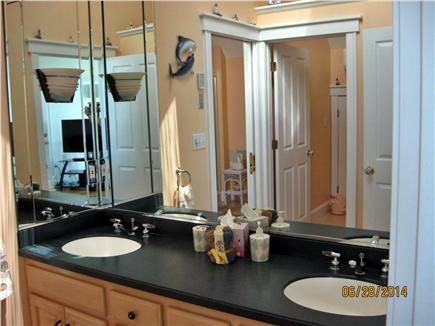 There is a full bath with a double vanity and walk in shower and steam unit on first floor. The laundry is also on first floor. The second floor opens to a large sitting area with sectional and TV. 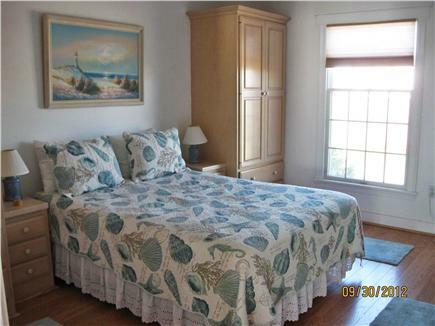 The master bedroom overlooks the beautiful warm water of Nantucket Sound, also on the second floor. 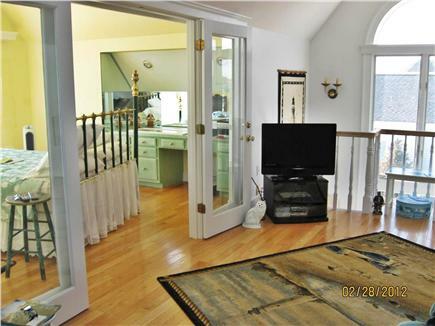 The second floor full bath has a jacuzzi and shower with a double vanity and large walk in closet. The ferry to Nantucket is approximately 6 miles from the home. All linens and beach chairs are supplied. A gas grill with propane is also available. Beach toys, books and games are also available for the kids. Additional availability info: rentals are from Sat to Sat. Check In time is 3pm and Departure is 10AM. This is a Saturday to Saturday vacation rental. Paradise on Sea Gull Beach! 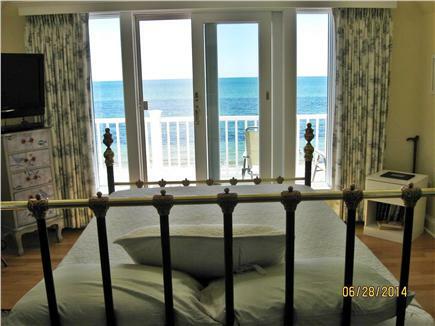 This was our first time renting a private home on the beach. From the moment we drove in to this lovely community, we knew we had picked area. 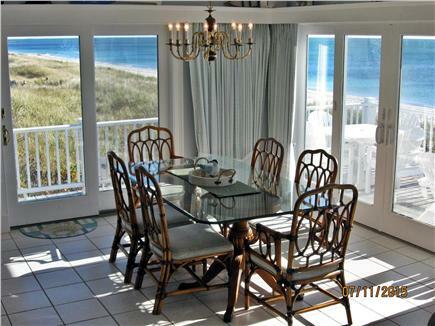 The house is beautiful, sits on a private beach, and the views you see every minute of the day are truly spectacular. The beach is private and gorgeous. There are groups of families and friends, some of whom have been coming here for 25+ years. They are friendly and welcoming and some even taught our friend's children how to fish. The beach never gets too crowded and we stayed most of the day and returned at night to walk and to fly a kite. So glad you and your family enjoyed your stay at my home! I look forward to seeing you again next year! Thank you! This our 10th year family vacation at this wonderful home. It is as beautiful as pictured. The deck is a great place for quiet conversations and enjoying the beach scene. Again this year we created some new family traditions. Over ten years I have run out of superlatives. 2015 provided another wonderful family vacation at your home. It was our 9th consecutive year. In that time, we have seen our grand-daughter grow from a squiggly five-year-old to a wonderful young lady. We have enjoyed wonderful breakfasts on the deck, quiet conversations, engaged in raucous family games and enjoyed beautiful sunrises. We have created new family traditions. The memories will last forever. Your home is a wonderful vacation location. We look forward to returning in 2016. Thank you, Frank and Annita. It is always a pleasure having you to my home. I always know that my home will be cared in the same way as if it was your own. I look forward to seeing you all again soon. Have a wonderful Holiday season. This is the perfect family home, with everything you could possibly need! 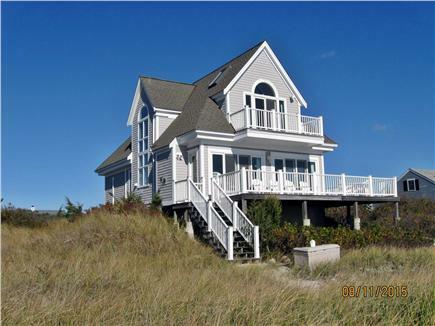 It is a spectacular oceanfront home, literally steps from the beach. Across the street was a pool that our kids loved, and spent each morning there. There is a lifeguard and floats, toys, etc. Hello Christine, Thank you for all the kind words. It is always a pleasure for me to have a family like yours as vacationers to enjoy my home. I appreciate the obvious care you gave during your stay. I hope you and your family will have the opportunity to return someday! Our family (adults, 3 kids - 13,16,17) had a fantastic week in Elaine's house. Everything was perfect: the house is well looked after, very clean and comfortable. We spent most of our time on the porch watching the sea. We didn't go out a lot as there's a good BBQ and the kitchen is huge with everything you need. The beach is private, so it's never crowded. We never went to the swimming pool (opposite the house), but we saw lots of families with smaller children having fun there. Hello Karin and Andreas, I am so very happy your stay was pleasant. I enjoyed meeting you and your family. Please know that I would love to have you back again. I appreciate the care and consideration you treated my home. Elaine is great to rent from! She is very easy going and and hospitable. The house is beautiful and clean, and our family had a wonderful, relaxing vacation. It was special to be right on the beach, and to be able to hear the waves while falling asleep. We hope to come back again. Thank you, Elaine! Hello Amy, Thank you for taking the time to write your review! I so hope you get to return to my property. It was a pleasure to have you! Have a wonderful Holiday season. Spent another wonderful family (adult children, spouses & grand daughter) vacation here. This is our 8th year. The location is superb- right on the beach. 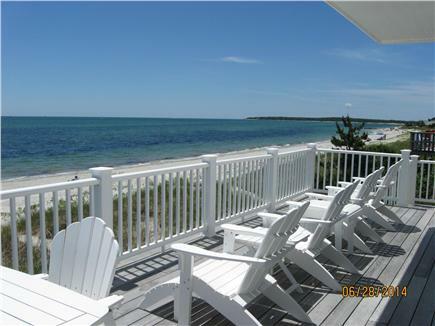 The deck overlooking the beach is a great place to relax. Home is well equipped and the layout provides ample places for the family to gather or for alone time. A quiet oasis that recharges our batteries every year. Can't say enough positives. Thank you, Frank. It is always a pleasure having you and your family! I appreciate the great care you take in keeping my property in such great condition! Hope to see you back again! Best Vacation House to rent to relax and have fun! I would like to say thank you for taking the time to submit your review. Glad to hear that all went well and you and your family had time to enjoy, relax and play. It was a pleasure to meet you and hopefully, if you get to return, I will get to meet the rest of your family (including the new addition). Have a wonderful Holiday Season! We had a wonderful vacation in August 2012. This house is fully equipped with everything that you will need. It was set up perfectly for families with children. Right on the beach. We sat in front of the house all week and enjoyed the private beach. Loved our vacation and look forward to going back next week. Elaine was great to deal with and very helpful! Thank you for taking the time to write your review. I enjoyed meeting you and your family and so glad to hear you enjoyed your stay. It has been a wonderful summer and can't believe it is coming to an end! Have a wonderful Holiday Season and hope to see you back again! 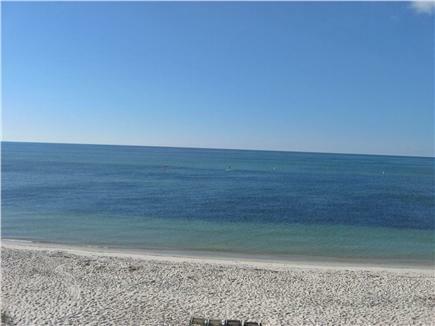 Excellent location; property is right on the beach. Mid-Cape location is close to everything on the Cape. Excellent for families. Our family has visited this property for the past 6 years. Each year before we leave we are planning our return trip. In a word - spectacular! Hello Frank, Thank you for taking the time to post your review. I very much appreciate not only the time you spent posting but for the special attention you and your family have always taken during your visit to my home. I am so happy you had a wonderful vacation and hope to see you all back again. Please say Hello to Annette!